This is Alan's mini-tube preamplifier. 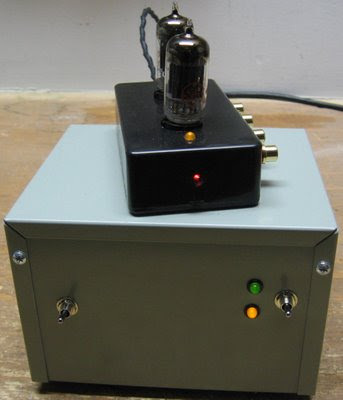 It is a very simple tube preamplifier project that will work with the 12AX7 or 12AU7 vacuum tubes, both of which are fairly common. The preamp is built using primarily parts that Alan had on hand. To make a real frugal build, the preamp can be built using 12V transformers and placed back-to-back in order to get the required high voltage and for the heater supply. Total costs for this project ran Alan about $30, with the majority of those costs going towards the enclosures and RCA jacks. The power supply is housed in a separate enclosure, also from Hammond. 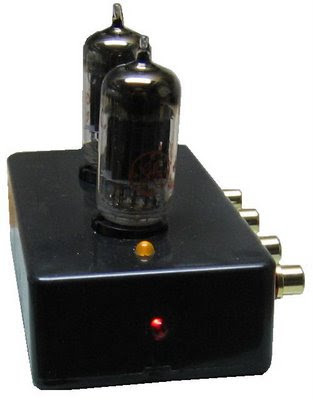 For full information, see the project page: DIY 12AU7 / 12AU7 Tube Preamplifier. This is a cool project. I might have to build me one of these!